I decided to give it another go this evening for a few hours as the incoming tide was strong due to the full moon. I started at 3:30pm with the usual salmon spinning setup. Chum salmon could be seen rolling at times, but none were interested in the spoon. We were after coho salmon after all. An hour into this absence of bites, Rob showed up for a chat. He then watched me creating the mother of all birdnests on the spinning reel. After untangling, I decided that it was time for the light spinning outfit to come out. 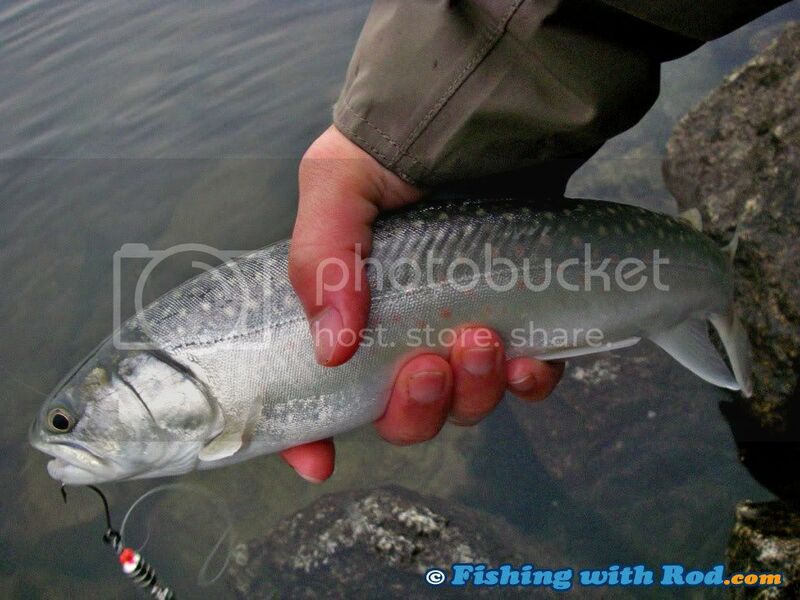 The 6lb rating would make bull trout fishing fun, but also sufficient enough for a small coho salmon. After a few casts with the 1/8oz green bladed spinner, I felt a solid take and found a good sized jack coho salmon at the end of the line. Even with the light spinning outfit, it came in with ease after a couple of leaps and runs. I brought it up in the net, wacked the head after seeing the absence of the adipose fin. Rob offered to take a photo for me, I gladly accepted it. Noticing that the fish’s head was covered with blood, I wanted to rinse it and have the photo retaken. I brought the fish to the water and washed the blood off. Suddenly it wiggled and slipped away from my hand. Sensing freedom, it gave itself a good kick to several feet from shore! Panic broke out on shore. I picked up my landing net while the fish swam slowly in circle on the surface. After a few attempts, I managed to push the fish back to shore with the landing net. 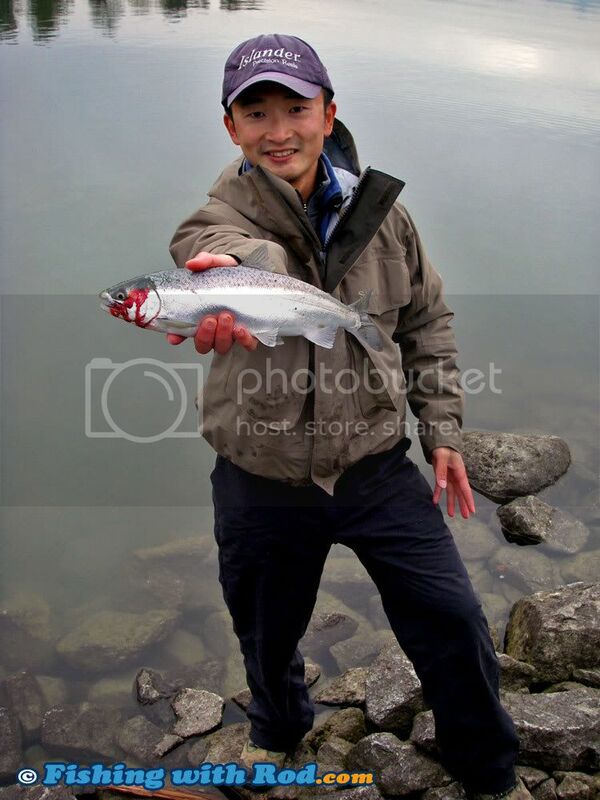 I then grabbed the fish and it slipped from my hand again! It, again, gave itself another quick dart away from shore! This time, even further away, unreachable with the net. I grabbed the spinning rod and began casting over it, hoping to use the spinner to… ahem, push it back. At this point, Marco came over to see what the heck was hapening. He then grabbed my other spinning rod so both of us were now trying to hook this little fish on the surface while Robj held the landing net, preparing to net in case it swam back to shore. After a few minutes, the unthinkable happened. The fish sank! The rest of the evening, which was only about 30 minutes long, I managed to hook and release two bull trout. I had chicken for dinner. This entry was posted on Wednesday, October 15th, 2008 at 9:18 pm	and is filed under Fishing trip. You can follow any responses to this entry through the RSS 2.0 feed. Both comments and pings are currently closed.